Thinking Pinoy: People vs Robredo: Leni counter-attacks, cries "persecution"
People vs Robredo: Leni counter-attacks, cries "persecution"
Will Robredo's impeachment backfire on Duterte? In Friday's “The Impeachment Numbers Game: Will Leni and Bolet enjoy South Africa?”, I explained how the presence of a Lower House supermajority makes the transmittal of Articles of Impeachment against Vice-president Leni Robredo almost certain. I also explained how the prosecution, in a prospective Robredo impeachment trial, has pretty decent chances of getting a two-thirds majority conviction, as 18 out of the 24 sitting senators belong to the majority. Vice-president Leni Robredo is facing a very real threat to her hold on power. First, Duterte enjoys the support of the supermajority and the House Speaker, so that the transmittal of anti-Duterte Articles of Impeachment will require a congressional coup, something that typically spineless congressmen are incapable of. Second, even if a senate trial were to ensue, Duterte enjoys the support of the 18-member senate majority bloc. Moreover, at least 9 senators will certainly acquit Duterte: (1) Cayetano, Duterte's 2016 running mate; (2) Pimentel, (3) Zubiri and (4) Pacquiao, the Mindanawons; (5) Gordon and (6) Lacson have been generally supportive of Duterte and vocal about it; (7) Villar, whose son [TP: Mark Villar] is Duterte's Public Works Secretary; (8) Ejercito, whose father Erap strongly supports Duterte; and; (9) Binay, whose father, ex-VP Jojo Binay, hates the Liberal Party's guts, and the last thing she'd want is another LP presidency. Thus, a two-thirds conviction against Duterte is impossible. Third, Duterte is currently a very popular president, and his removal will inevitably result into mass unrest. Imagine a repeat of Duterte's Miting de Avance but with an angry mob this time. In short, vis-a-vis the impeachment complaints against the two highest-ranking officials in the land, Duterte is certainly safe, while Robredo is certainly in great danger of losing her post. I think it's safe to say that Duterte will not be impeached, so let's focus on the Robredo impeachment issue. According to WeAreSocial's Digital in 2017 Global Review [WaS 2017], the Philippines experienced an astounding 25% growth (12 million new users) in number of social media users compared to the past year. There are 60 million Filipinos active on Facebook right now, compared to about 48 million a year ago [WaS 2016], or an increase of about 12 million users. The Facebook Insights snapshot shown above, taken on 26 March 2017 at 12:00 PM UTC+8, lists the analytics data of the most popular pages of each political camp based on likes and engagements. The anti-Robredo pages in the list are Thinking Pinoy, Mocha Uson Blog, and For the Motherland – Sass Rogando Sasot. Meanwhile, the pro-Robredo pages in the list are Leni Robredo's official page, Friend of VP Leni, Juan Nationalist, Silent No More, and Superficial Gazette. 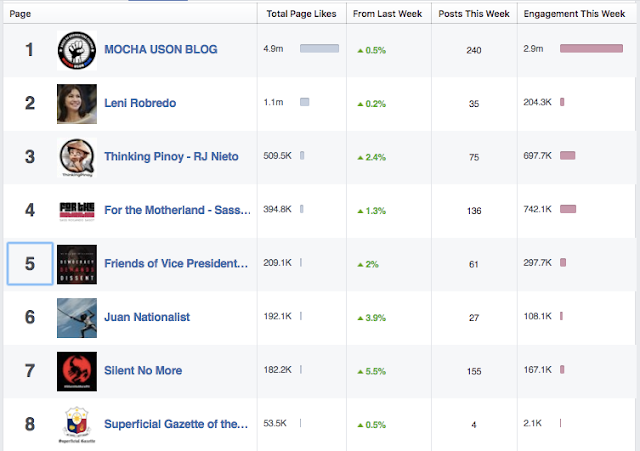 Note that I did not include pro-Robredo pages with negligible engagement rates, i.e. those with below 100 thousand. And for brevity, I also didn't include other major anti-Robredo pages like Lapu-lapu, Duterte Today, Mindanation, and Crabbler. The combined engagement rates of all five major pro-Robredo pages is less than 800 thousand, while the combined engagement rates of the three major anti-Robredo pages is around 4.4 million. Suffice it to say, if Facebook were to be used as a gauge of public clamor for Robredo's removal, then yes, Filipinos want Robredo ousted. Now, Robredo die-hards may argue that, despite the enormous disparity between the pro- and anti-Robredo stats, all of these numbers are just, as a self-proclaimed veteran journalist puts it, “manufactured noise”. A couple of weeks ago, pro-Duterte musician Jimmy Bondoc and company thought of organizing a mass demonstration in support of President Duterte who, at the time, was besieged by an impeachment complaint lodged by Trillanes-aligned Magdalo party-list Rep. Gary Alejano. Bondoc named the April 2 event “Palit Bise: Suporta sa Presidente”, which roughly translates to “Replace the Vice(-president): Support for the President”. Okay, I think you know what that means... then Bondoc did something unprecedented: he turned to crowdfunding to finance the event, arguing that the demonstration must not involve the support (or present) of any traditional politician. On the evening of 20 March 2017, Bondoc launched a crowdfunding campaign for #PalitBise with a goal amount of US$20,000, or roughly Php 1 million. Bondoc said the amount will be used to pay for the sound system, security, and other miscellaneous expenses of what is anticipated to be a massive event. Bondoc's call for donations was shared by OFW groups, Duterte-aligned social media pages, and private citizens. 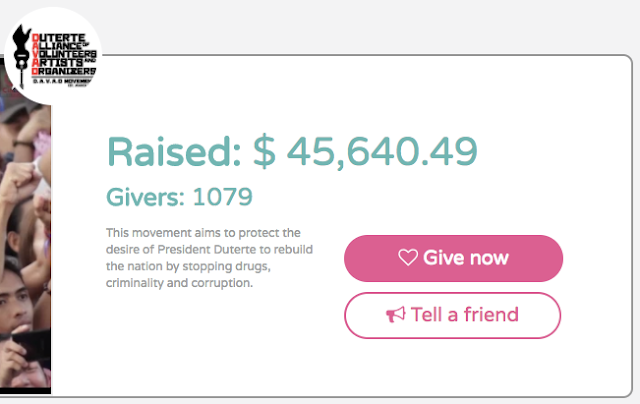 In just three days, crowdsourced donations reached a total of US$45,640.49 [GavaGives] or about Php 2.3 million, exceeding the goal by over 128 percent. There are more than 1079 givers but due to numerous DDoS attacks on the website caused a bug on the counter. Save for a couple or so donations of $1,000, all other contributions were very small at around $30. Bilang ordinaryong Pilipino, ako'y naninindigan upang ipaglaban ang kinabukasan ng bayan ko at ng magiging anak ko. TRANSLATION: For the voiceless and the destitute and for our beloved President... President Duterte, you're our country's last hope. So even if I can contribute only a small amount, I hope this will help protect you so you can continue your work for the poor. All the other donors shared similar sentiments: support for the president and contempt for the vice-president. The April 2 #PalitBise rally will be first crowdfunded mass demonstration in Philippine History. Now, what does that say about the public's stance on the Robredo Impeachment Issue? 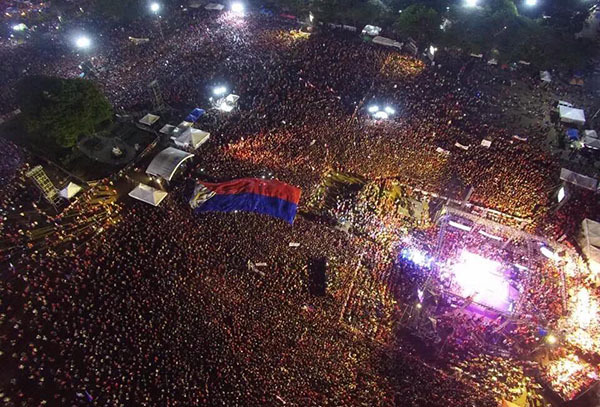 A turnout of at least 100,000 warm bodies in Luneta in the April 2nd #PalitBise Rally will galvanize the notion that there is indeed public clamor for Robredo's removal. A turnout of 200,000 can even sway some anti-impeachment senators' opinions. And finally, a turnout of 500,000 or more can make Robredo's removal practically inevitable. But the issue is not as simple as taking away the vice-presidency from Our Lady of Naga, as Robredo's international propaganda machinery can spin this prospective removal to their favor. Robredo has started painting herself as the martyr persecuted by the powerful Duterte administration. With the help of the Liberal Party's massive financial war chest, she has the option to repeatedly hammer this notion ad nauseam to the international community for the duration of a potentially months-long impeachment trial. And I think I forgot to mention that LP's funds for international PR is likely to receive a boost next week, when Leni flies to South Africa to meet the international Liberal Democrats (LibDem), thanks to LP's German LibDem financier Friedrich-Naumann-Stiftung für die Freiheit (Friedrich Naumann Foundation for Freedom) [Freiheit]. Yes, the potential side-effect of removing Robredo is the reinforcement of Duterte's international image as a ruthless despot. First, Duterte should distance himself from the impeachment issue as much as possible. This allows him to wash his hands by arguing, during and after the impeachment process, that Robredo's removal is purely the work of the People and that he had nothing to do with it. Second, the Filipino People should visibly and massively show its support for Robredo's removal. On 23 March, Duterte told his supporters to stop any attempt at impeaching Robredo [TV5]. A day later, he asked Robredo to sit next to him during the PNPA graduation ceremony [GMA]. Yesterday, Malacanang confirmed that Duterte invited the Robredo family to dinner in the palace [ABS]. Thus, the ball is already in the people's court, i.e. it's time for the Filipino People to do its part: the second prong. If you want Robredo to be removed with minimal side effects, I highly suggest that you join the 02 April #PalitBise: Suporta sa Presidente mass demonstration in Luneta, and continue to voice your opinions on the streets and in social media for the duration of the impeachment trial. With that said, don't you think it's time for us to have a say on who stays in power and who does not?